While there are many issues and violations in the joint use world, there are a few we see so often we consider them problems of interest: repeat offenses to which no utility pole owner is immune. 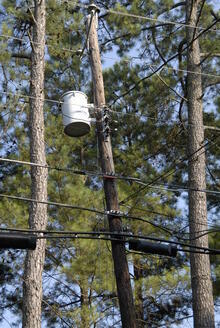 This blog is the sixth in an ongoing series detailing utility pole issues and the steps it takes to remedy them. Today, we tackle a safety issue that could result in injury to a most-valuable asset—your workers and technicians: improper climbing and working space. Any number of things can potentially obstruct this clear space, but signage attached to the pole, overgrown vegetation and improperly spaced attachments are fairly common occurrences. As with many of the safety and utility pole maintenance issue-related problems we have detailed in this series, simply discovering and acknowledging an issue like this are the toughest parts of the battle. One great way to keep track of both the climbing and working space on poles, as well as track repairs is to employ the use of a robust joint-use inventory and management solution. Software that gives utility pole owners a great deal of information about and control over day-to-day maintenance and the remedy of issues like this. Online, cloud-based information makes updating of pole statistics accessible to anyone in the organization. Capture and organization of attacher information, contracts and other vital communication details makes getting in touch with a company to fix a low-hanging attachment easier. Features such as the ability to put timers on common tasks makes keeping up with routine checks more efficient and traceable. The sum total of these features add up to valuable benefits: a more organized, connected view of all of your utility poles, a safer workplace for technicians and a more reliable plant. Why fix climbing and working space issues? Not having the proper clearance for climbing space and/or working space is not only dangerous, but also potentially expensive to correct. Vegetation, for example, should be maintained on a regular basis to keep pole owners from having to deal with much larger jobs when years of overgrowth are at issue. Simple measurement procedures conducted during regular field inventories will help to identify attachment encroachment, giving owners a chance to remedy the situation before it becomes an issue. Most importantly however, everyone deserves a safe and productive workplace. When your office is a 40-foot pole and your desk is 20 feet in the air, simply having the space to move freely can mean the difference between a good day at work and a dangerous one. Let’s keep it clear—and safe—out there, everyone.